FireOx International : Sustainable Fire Engineering - What is SFE ? What is Sustainable Fire Engineering ? and such extensive disruption of a city’s social and economic fabric. Fire Engineering … including Fire Prevention, Fire Protection & Management in Buildings … is a major Multi-Billion Euro/Dollar component of the Construction Industrial Sector worldwide. Unusual fire behaviour and a range of difficult fire safety issues (critical, in the case of firefighters) also arise from the Innovative Design Features (e.g. The fire hazard is enormous if, at any time during the long life cycle of these buildings, vegetation maintenance becomes inadequate or fails, and the vegetation dries out. Has sufficient consideration been given to fire safety in this case … and in many other Sustainable Buildings around the world ? And in fire incidents which have actually occurred in Sustainable Buildings, frontline firefighters have faced unusual and life-threatening challenges. A wide chasm separates the language and understanding of these two very different design disciplines. As a result, the performance of Sustainable Buildings can be seriously compromised. If, on the other hand, adequate independent technical control is absent on site … it is fire safety which is weakened or compromised. building … these problems are ignored and remain hidden … until a serious fire breaks out ! To restrict and control external fire spread across a building façade … an external fire suppression system, e.g. water mist or deluge, must be considered … depending on the local context. 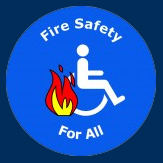 of Fire Safety for All, not just for Some. In essence … Sustainable Fire Engineering must heavily front-load fire prevention and fire protection measures … above and beyond the very limited and flawed fire safety objectives mandated by current building codes and regulations. building users … with the overall goal of realizing and maintaining a Safe, Resilient and Sustainable Built Environment for All. Sustainable Fire Engineering facilitates positive progress towards the United Nation’s 17 Sustainable Development Goals & 169 Performance Targets, which were adopted in September 2015. And it is only Sustainable Fire Engineering which can fast-track proper compliance with the Basic Requirements for Construction Works in EU Construction Products Regulation 305/2011(Annex I), specifically the interlinked Requirements 7, 2, 1, 3 & 4. Existing approaches to Fire Engineering Education and Training must be radically transformed to deal with the harsh realities of today … not with imaginary future challenges ! … but to facilitate the search for injured firefighter colleagues. Firefighter Safety can so easily and reasonably begin with Building Design ! by ALL building users … but also assists in preventing firefighter disorientation. 2. Fighting the fire, and confirming it is extinguished. Firefighter Safety must, therefore, be included as a basic and essential Fire Safety Objective in All Building Codes and Regulations ! These ‘Sustainable’ Building Types are more popularly known as Green, PassivHaus/Passive House, +Energy, Low/Nearly Zero/Zero Carbon, LEED, Eco, Bio, BREEAM, or SMART, etc., etc., etc. Without a balanced, proper approach to Fire Safety in this type of modern, high-performance building … Building Occupant & Firefighter Safety is seriously threatened ! at least 200mm … plastered on both sides, not dry-lined, for adequate smoke resistance … and be continued above the roof covering for at least 300mm. 2. An effective Fire Detection System must be installed. The conventional ‘package’ of one smoke detector per floor in the hallway and staircase of a standard 2 storey semi-detached house is nowhere near being adequate. 3. An effective Residential Fire Suppression System must be installed, e.g. low pressure water mist. and to provide an exhaust route for smoke and toxic gases … during the short period of time prior to activation of the fire suppression system. 5. Intermediate Timber Floors and Evacuation Routes, including fire resisting doorsets, must be reliably protected from fire and smoke. The minimum period of fire and smoke resistance must be linked to local fire service support infrastructure. In other words, the local fire services must be allowed sufficient time to arrive at the scene of a fire in strength … to search for any occupants still remaining in the fire building … and to bring the fire under control. 6. Uppermost Ceilings under a trussed timber roof structure, including any trap doorsets into the roof space, must be similarly and reliably protected from fire and smoke. Once fire enters a roof space, the light trussed timber structure will collapse within a few minutes. 7. Front and Back Entrance/Egress Doors must be outward opening. In the 2013 German PassivHaus Apartment Fire, the occupant found it extremely difficult to open inward opening doors and windows because of the high positive pressure caused by the developing fire. This unusual phenomenon was confirmed in the 2015 Finnish Apartment Fire Tests, when much higher positive pressures were observed. 8. Internal Linings of External Walls must comprise 2 layers of plasterboard, with all joints staggered … steel fixed, at not more than 150mm centres. these linings, even if properly installed (! ), are too little and too late. 9. Frontline Firefighters must be supported by specialist structural engineering and hazard appraisal units … and light/portable/reliable Thermal Imaging Cameras must be considered as a standard tool of firefighting. Occupant & Firefighter Safety and Building Fire Protection. and they must be solved by reviewing the full checklist above. concept of Sustainable Human & Social Development. How is the concept of Sustainability evolving ? if unchecked, will result in disproportionate damage, and may lead to total building collapse.